Embark on a once-in-a-lifetime expedition to South Georgia with its intoxicating mix of wildlife, on a grand scale. Be surrounded by thousands of king penguins, wonder at the size of wandering albatross and marvel at the strength of the mighty elephant seals. South Georgia is a photographer’s paradise, full of extraordinary wildlife experiences. In the summer months, king penguins take over favoured places on the shore to raise their chicks. At the peak of the season, there can be several hundred thousand penguins in residence; the sight and sound of these brightly coloured birds stretching as far as the eye can see is one of nature’s most amazing wildlife spectacles. One of the most amazing behaviours of the second largest penguin species in the world is the parenting ritual. Each year, a king penguin couple mates, and then take turns to incubate the egg and protect the chick while the other looks for food. This is an exceptionally inhospitable environment, with winter temperatures reaching -30ᵒC in coastal areas, and it’s vital that the young king penguins are kept warm. After birth, the chicks only have a thin pelt until they develop their distinctive brown fur; sitting on mum or dad’s feet, covered by a pouch, is the only way to keep warm. When they’re old enough, the juveniles are left with other youngsters while the parents go off looking for food. King penguins have a long period of nurture, with breeding beginning from September to November. It’s not until up to 16 months later that the youngsters are ready to go sea, usually in spring. 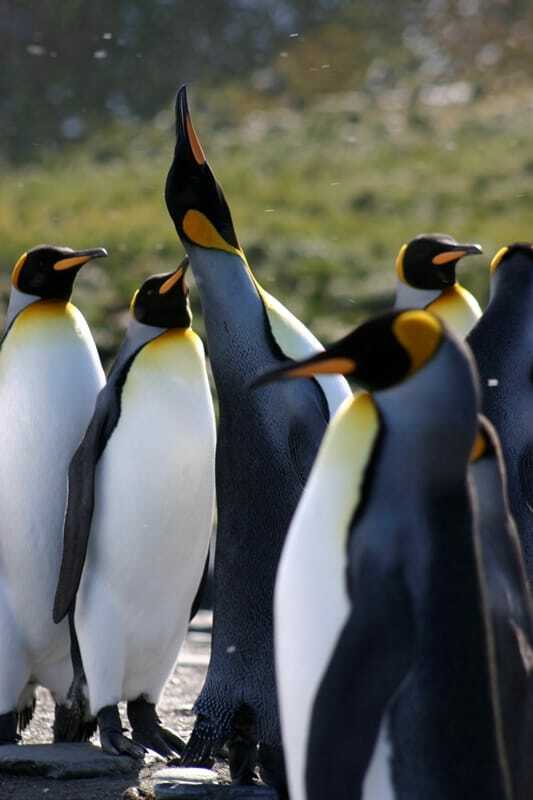 In addition to king penguins, South Georgia is home to an array of other wildlife, including macaroni, gentoo and chinstrap penguins. Just offshore sperm, pilot and killer (orca) whales swim as well as hourglass dolphins. Elephant and fur seals inhabit beaches and old abandoned villages. South Georgia is also famous for wandering albatrosses, the world’s largest seabird. It’s possible to witness their breeding efforts and watching their aerial displays. Grytviken was established as a whaling station in 1904 by Norwegian captain, C A Larsen, and became very successful. Even though the industry ended in the 1960s once the whale population had been decimated beyond economical viability, evidence of the gruesome trade is everywhere. The beaches near Grytviken are scattered with the bones of long-dead whales and the rusting hulks of whaling ships and whale oil boilers sit, slowly decaying on the shore. On most trips to South Georgia, you can visit the South Georgia Museum and the old site of whaling operations. South Georgia also has its place in the history of polar exploration. Ernest Shackleton and five other crew members reached its southern coast in 1915 after their ship, the Endurance, was wrecked. From their make-shift campsite at Pegotty Bluff, the explorer and remaining members of his crew set-off for a marathon trek across the island to the northern port of Stromness. It was from Grytviken that Shackleton ordered his rescue mission. His widow chose South Georgia as his final resting place; his grave is now a place of pilgrimage for visitors to the island.